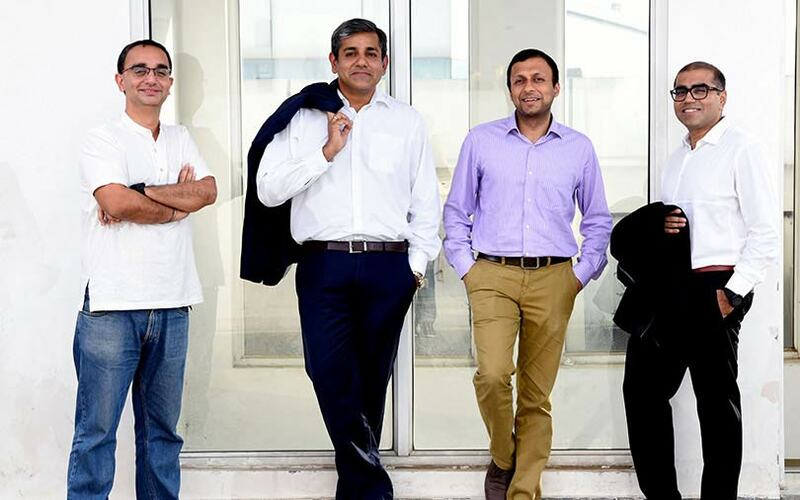 (Left to right) Mettl CTO Guneet Sahai, CRO Siddhartha Gupta, COO Tonmoy Shingal, and CEO Ketan Kapoor. A week ago, online skills assessment startup Mettl managed something rather rare in the Indian startup ecosystem — it delivered a profitable cash exit to its venture capital and angel investors. That exit came courtesy Gurugram-based Mettl’s acquisition by Mercer, the global human resources consulting giant. 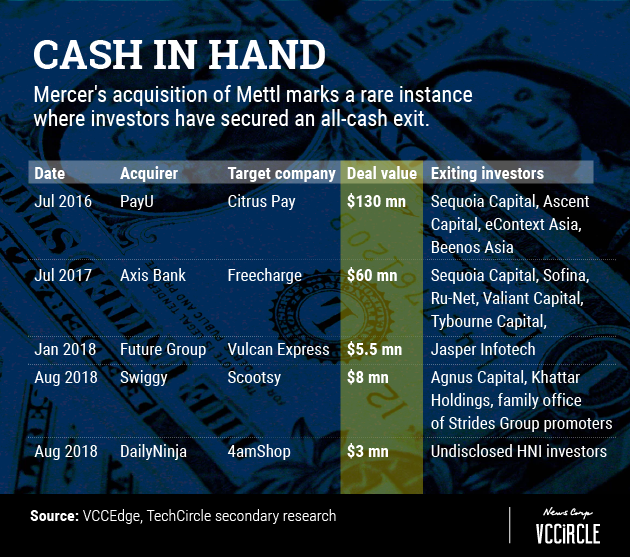 The details of the transaction are yet to be officially disclosed, but a person close to the development told TechCircle that Mercer had paid Rs 300 crore (around $40.5 million) to seal the buyout. From Mettl’s employees to its dozen-odd investors, it appears that everyone involved has reasons to be cheerful. Blume, which entered Mettl at the seed stage, added that it had scored 7x returns on aggregate capital, taking into account its combined seed and Series A investments. Founded in 2010 by Ketan Kapoor and Tonmoy Shingal, Mettl had raised $4.5 million from at least 11 institutional and individual investors prior to being acquired. Apart from Blume, the company’s other early investors included high net worth individuals (HNIs) such as Kae Capital founder and managing director Sasha Mirchandani and ad-tech unicorn InMobi’s founder and chief executive Naveen Tewari. In August 2012, it raised a $4 million Series A round led by Bengaluru-based venture capital firm Kalaari Capital, which was known as Indo-US Venture Partners at the time. Blume also participated in that round. It wasn’t clear whether Mettl’s other HNI investors exited with the Mercer acquisition or earlier. Kalaari Capital earned about Rs 75 crore (around $10 million) from the deal, said the person familiar with the transaction who did not wish to be named. It’s not clear exactly how much Kalaari had invested in Mettl. Email queries sent to the VC firm seeking further details and its comments on the exit did not elicit a response till the time of publishing this report. And Mettl’s venture capital investors aren’t the only ones who have made money. Ketan Kapoor, the company’s co-founder and CEO, said that as many as 60 employees have made anywhere between “a few lakh rupees and a few crores,” by cashing in their stock options. According to Blume’s Reddy, the build-up to the acquisition began some time early last year. The company was originally in the market for a fresh round of funding to kickstart the next phase of growth. “That thought process started in the middle of last year and then we appointed a banker to initiate the whole process,” Reddy said. Mercer, however, entered the fray of its own accord. Kapoor was in for a surprise while delivering a remote demo of the company’s products to Anish Sarkar, Mercer’s India head who was in Singapore at the time. Sarkar asked Kapoor to take the earliest flight out and visit his office. “I think they liked what they saw,” said Kapoor. The two companies continued to interact with each other for the next 14-odd months till Mercer finally decided to seal the acquisition. Kapoor seconds that. He claimed there were other suitors but declined to name them. “We could have raised more capital from private equity or venture capital funds. But we wanted to go global,” he said. Mercer, a wholly-owned subsidiary of NYSE-listed professional services firm Marsh & McLennan Companies, operates in over 140 countries. Following the acquisition, all of Mettl’s 380 employees will join Mercer and Mettl will retain its independent brand identity. The company offers a software-as-a-service (SaaS) platform that uses big data analytics to help companies maximise their human potential by measuring talent. Its assessment platform is primarily used to screen candidates for recruitment (both entry level and experienced profiles). The platform measures personality, ability and job-specific skills. Mettl also licenses its platform as a standalone technology for clients’ own content. Its multilingual assessment software platform is being used by more than 2,000 companies spread across 80 countries. Kapoor said that Mettl had net sales of Rs 38 crore in the financial year 2016-17 and claimed that the company has been profitable since 2015. That said, the online skills testing business isn’t yet a significant segment in the overall technology startup ecosystem in India. Mergers and acquisitions have also been few and far in between. The last major buyout was in 2016 when human capital and management consulting services firm Aon Hewitt acquired Gurugram-based online assessment and campus hiring platform CoCubes.com for an undisclosed sum. Blume’s Reddy believes that if Mettl hadn’t been acquired, it would have turned out to be a great business. “If Mettl had continued to exist for the next five years, my bet would be that they would have acquired other companies. They would have built a large customer base, some adjacencies… if the founders could have raised growth capital let’s say three years ago, they would have had a greater shot at building a $40-50 million revenue business instead of the $10-15 million they are at now. But three years ago, there just weren’t enough people (investors) to believe in this vision,” he said.